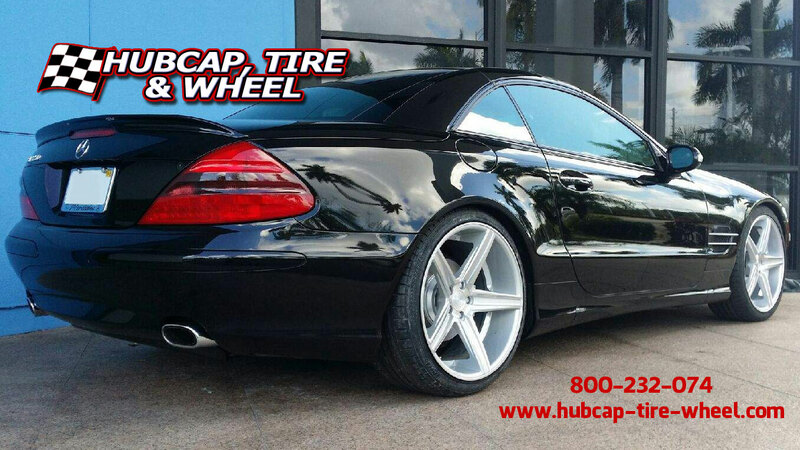 Take a look at our customer’s black 2003 Mercedes SL500 with silver machined Niche Apex rims with a staggered fitment. The car came out great and looks a ton better than the plain stock wheels. We fit this car with a staggered fitment which is when the rear wheels are wider than the front wheels for that extra traction needed when tacking off from the line with a rear wheel drive car. These wheels gave this Mercedes SL 500 a nice sleek and classy look which is what our customer was going for. If you have any questions regarding the fitment of these wheels on your vehicle please don’t hesitate to call our wheel and tire specialists to help you out. Call us: 800-232-0734. We will guarantee wheel fitment on your vehicle or your money back. No questions asked. It’s available for 19/8.5 18/9.5. Stock levels change daily. Give us a call to get the latest on inventory levels. 800-232-0734.